I didn't grow up on CBS News - we were a NBC News family - goodnight Chet, goodnight David! 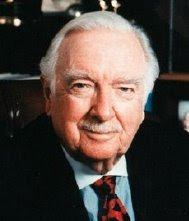 So I didn't really discover Walter Cronkite until after he retired. And that's when I realized what I'd missed all those years! In 1996 he wrote his autobiography "A Reporter's Life" and it help cement my affection for a truly remarkable man and the impact he had on our lives. Even though I didn't really know him when he was the face of CBS, his impact did affect my life and I'm so grateful for him. I know there are others who feel as I do; but, with all the media coverage, you'd have thought that MJ gave more to us than Walter Cronkite did, instead of the other way around.